I can’t remember a week like the one we’ve just had. It was even angrier than usual. It was deeply personal. It had a vicious edge to it that I hope doesn’t last. All those aspects of it were reported and I don’t want to use this email to simply relive all the parts of this week that you already know. But behind all of that there was a policy debate on a range of issues that is tremendously important which received less attention. So here’s the #5and5. 1. In case you were wondering why Scott Morrison is Treasurer, it’s apparently because the man is a genius. We have this on the authority of Scott Morrison. 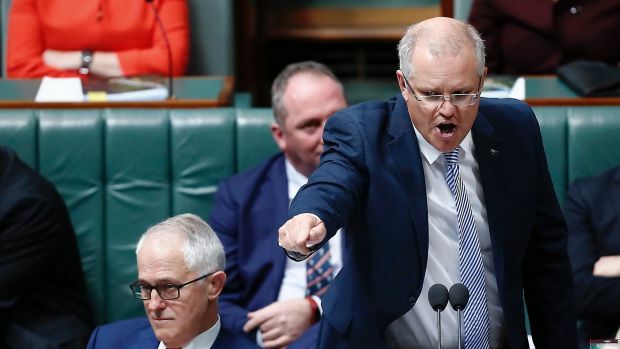 Chris Bowen pressed Scott Morrison about the revelation that Treasury advice on negative gearing had been the opposite of what Scott Morrison had been claiming. We discovered the reason for ignoring the advice was he is smarter. He apparently does his own analysis and came to the conclusion that anything Labor had said was very bad. So there. 4. Many of the agricultural pests and diseases which cause massive problems on mainland Australia aren’t found in Tasmania. But recently, fruit fly has arrived. The Tasmanian Liberal Government has been cutting money for biosecurity. Julie Collins asked about the biosecurity failures of the Federal Government and the Tasmanian Liberal Government causing real harm to Tasmania's fruit-growing industry and the thousands of jobs that rely on it in Tasmania. The new Agriculture Minister David Littleproud claimed there was plenty of money and everything was good. Tasmanian Labor MPs made speech after speech demanding action. 1. The Closing the Gap speeches will be next Monday but the simple message is this. The gap isn’t closing. We are going backwards. When we acknowledge the importance of Kevin Rudd apologising to the first Australians we should never forget that in the same speech he established the principles for annual reports, targets and consistent measurement on issues like life expectancy and infant mortality. This reform ensured there would be a focus to close the gap. We would know when we made progress and if we ever went backwards it couldn’t be hidden. Next Monday, no one will be able to avoid the facts. 2. Dan Tehan is the Minister for Social Services. I could probably leave it at that, that’s enough to put him on the worst list in this Government. But his performance in Question Time this week was beyond belief. We tried a strategy that’s a bit different to how we often ask questions. Instead of adding questions about how bad the Government is or inserting extra explanations about how we know they are hurting people, Jenny Macklin put the heat on by asking simple, short questions – the sort of questions you’d expect a Minister to know the answer to. His answers were bizarre. His response to a question about the Government’s plan to axe the bereavement allowance to grieving widows opened with the words “It’s funny…” When I took a point of order that he wasn’t talking about widows in a question about payments to widows he defended himself saying “I wasn’t referring to the widows.” When Jenny asked him about the deeming rates on the savings of part pensioners he talked about policies to get people back into the workforce. Yes. That’s right. Getting people back into the workforce was his response to a question about the savings of pensioners. Finally late on Thursday Dan Tehan tried to prove he was vaguely competent by getting one of his own backbenchers to ask him a question. After he had finished he sat down feeling he’d finally had a question which wasn’t a train wreck. Jenny was straight on her feet asking: “I ask that the Minister table the document that he read word for word from.” He refused claiming his notes were confidential. Not so confidential now given he’d just read every word of it out loud to the Parliament. Click here to have a read of this section of the Hansard and know that it was 10 times worse watching it live. 3. Every day we pursued the key challenge on the cost of living: prices going up while wages hardly move. The shallowness of the Government’s claim that giving a $65 billion handout to big business will somehow help wages was exposed with one simple comparison from Bill - last year company profits went up by 20 per cent while average wages for Australians only went up by two per cent. These cuts are a large focus in the South Australian election. 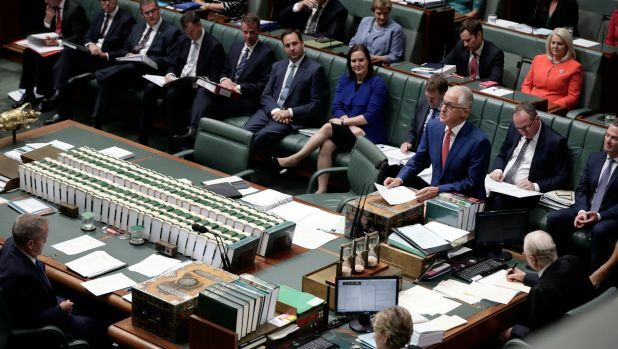 South Australian Labor MPs Amanda Rishworth, Nick Champion, Tony Zappia and Steve Georganas argued the point that the cuts wouldn’t have happened without Nick Xenophon voting with the Liberals to cut funds to schools. 5. The Minister for the Environment is responsible for many things. You might have thought the environment was one of them but apparently not. Reports emerged this week around allegations that Adani had tampered with scientific evidence which was provided to Government authorities relating to a spill of coal-laden water in the Caley Valley Wetlands. You might not have heard of those wetlands but they are wetlands which have specific federal conditions against them where the Federal Environment Minister as a matter of law is meant to have responsibility. Well so you would have thought if you read the law. But if you listened to Josh Frydenberg we’re told it’s got absolutely nothing to do with him. So for three days, twice on the floor of Parliament and once in a media release, Josh Frydenberg kept asserting that enforcing a federal approval was a Queensland state matter and absolutely nothing to do with him. We already knew this Government wasn't interested in protecting the environment, now we discover they don’t even have a Minister for it. It doesn’t really fit in a list like the #5and5 but Susan Lamb’s speech on Wednesday was extraordinary. It was honest and personal and confronted a story that was simply hard to tell. Importantly it reminded me that the people we put forward for Parliament aren’t from some identical cookie cutter background. We’ve been lucky and unlucky in different ways. Our stories can be as complex as anyone’s. As Susan said “not all families look like the Australian version of Little House on the Prairie”. We will be back in Canberra next week and hopefully the tone of debate improves. PS There’s a new Cold Chisel “Barking Spiders” concert coming up but it’s on a sitting night so I’m kicking myself that I can’t get to it. And I also spent much of summer trying to learn Khe Sanh on the piano. So in honour of one of my favourite bands of all time here’s a little tribute to Dan Tehan: Cold Chisel’s “No Sense” which has the perfect chorus: “you just go on and on and you don’t make no sense”.